I know that it’s been summer for awhile now, and that actually, it’s beginning to draw to a close, but “summer” (or vacation) has just begun for me. The last couple of weeks have been mildly chaotic (in my brain) between trying to rearrange schedules with clients, adding more clients and students, and traveling itself. This is my first year working in private practice and it is much more difficult to take time than when I was working full-time. With that being said, my usual work style and preparation has been altered the last couple of weeks. I’ve been spending a bit of time lately doing more “research” on new ideas and interventions. That has lead me to some great resources I wanted to share which have sparked new ideas I’ve found, adapted, and recreated. This, in essence, is my shoutout to Pinterest. Pinterest. 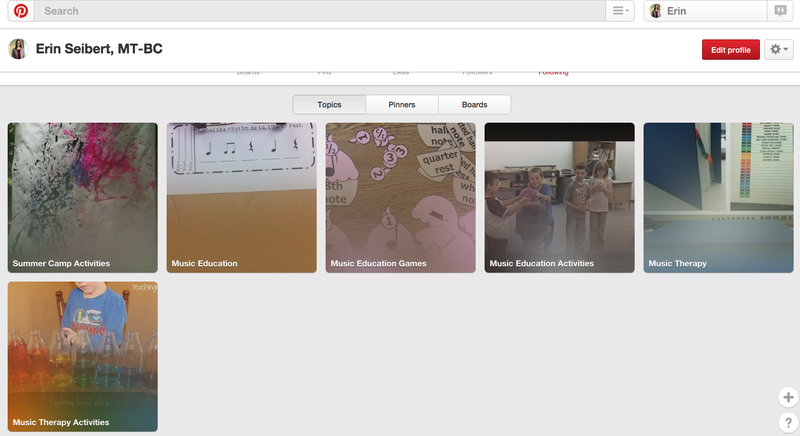 Obviously Pinterest is a wealth of information, but I had never used it before this year for music therapy and education related information. In preparation for creating this website, I was revamping a lot of my public social media and realized I wasn’t interested in sharing my Pinterest boards, which featured hairstyles, yoga moves, and house decorating ideas, with strangers; at least, not in relation to my professional self. I created a new account and found this incredible tool called following topics (found in your profile under “following”). I joined Pinterest back when it was just a baby in the social media world and never checked out the new and added features as they arose. I understood that I could follow people (pinners) and specific boards, but I never knew I could follow general ideas. Maybe I’m a newb in the social media realm, but I think these kinds of changes often occur unnoticed if we aren’t looking for them. I began to follow the following general topics: “Music Therapy”, “Music Therapy Activities”, “Music Education”, “Music Education Games”, “Summer Camp Activities”, and “Music Education Activities”. Pinterest now does all of the work for me to generate related pins (all taken with a grain of salt, of course). I have now spent many successful hours perusing my feed at my leisure, while allowing my brain to spark creativity and seedlings of ideas. 1. Thefameschoolblog.com I found a pin from this site about creating a songwriting game, which I fell in love with immediately. As I continued to peruse this person’s blog, I found even more “musical games” aimed at her piano students that could be just as easily adapted for various music therapy strategies. I pinned a few more ideas I had found in addition to the original. 2. Sesame Street YouTube Channel This has been a disappointing find for me only because I currently have zero clients where using these songs would be appropriate. But there are SO MANY great songs sung by artists and Sesame Street characters that can be used in awesome sessions with kids and even pre-adolescents (if used correctly and without the characters!). The song below is currently my favorite for the importance of social intelligence, emotional skills, and self control. 3. Wholesome Harmonies and Listen and Learn Music are both blogs created by other music therapists, whom I see pop up on Pinterest the most often. This either means they are really good at that social media thing (which they are) or their resources are very catchy and inspire others (which I believe they do). They have a ton of information on both their sites, which might take a bit of sifting through to find what might work best for you, but it’s worth it! I have pinned many other ideas that are just idea seedlings at the moment. This means that I either think the idea is great as is but isn’t appropriate for my currently clients, or the idea has sparked an adaptation in my mind that has yet to be created. If you’re interested in following what I pin as time goes on, you’re welcome to follow me below. I foresee many more pinnings…. Erin, thanks so much for all of this info! I’ve been reading through and I can’t tell you how much it helps to know what other MT-BCs are using as resources, plus knowing that there ARE other MT-BCs that need inspiration and have creative blocks. I’m definitely gonna keep visiting this page and learning from ya! I’ll see if I can return the favor via Pinterest or other fabulous options. 😉 Keep up the awesome work!! You rock.